Whatever happened to Joanne Woodward? Oscar-winning actress and widow of Hollywood legend Paul Newman - that's Joanne Woodward. Sadly, however, Joanne can't recall the many years she shared with her late husband, who died of lung cancer in 2008. Now 87 years old, Woodward suffers from Alzheimer's disease (Ironically, she won an Emmy Award for her portrayal of an Alzheimer's patient in the 1985 television movie Do You Remember Love). Joanne Gignilliat Trimmier Woodward was born in Thomasville, Georgia on February 27, 1930, the daughter of Elinor (née Trimmier) and Wade Woodward, an administrator in the Thomasville school system. Thomasville is an ordinary small town in southern Georgia, near the Florida border and Joanne came into the world in the midst of the Great Depression. She had an older brother, also named Wade. Joanne's mother, a movie buff, named her after Joan Crawford, using the Southern pronunciation of the name - "Joanne." Joanne shared Elinor's passion for movies and mother and daughter enjoyed viewing films together. In the late 1930s, the Woodward family moved to Marietta. Georgia, a suburb of Atlanta. Joanne's father became a travelling salesman and her mother worked for Bell Aircraft Corporation (known as Bell Bomber), which was flourishing during World War II. Joanne and her mother delighted in the movie Wuthering Heights, starring Laurence Olivier. In 1939, Elinor brought her daughter to the premiere of Gone with the Wind in Atlanta. The nine-year-old dashed into a limousine carrying Olivier and Vivien Leigh, the film's star (Olivier and Leigh married in 1940) and promptly sat on the great actor's knee. Years later, when Joanne worked with Sir Laurence in the 1977 TV version of Come Back, Little Sheba, she mentioned the incident to him and he remembered it. As a teenager, Joanne entered and won a number of beauty contests, although acting was always her primary passion. Her father, who eventually became vice president of publisher Charles Scribner's Sons, needed convincing that a career in acting was the right path for his daughter. Joanne's parents divorced and the family moved to Greenville, South Carolina in 1945. In Greenville, Joanne began performing at the local theatre, the Greenville Little Theatre, where she received favourable reviews. She played Laura Wingfield in a production of Tennessee Williams' The Glass Menagerie. When Joanne graduated from Greenville High School in 1947, her drama teacher encouraged her to pursue an acting career in New York City. Her father, however, wanted her to have a college education. Deferring to his wishes, she enrolled at Louisiana State University in Baton Rouge and and majored in drama. She left the university after two years, returning home in 1949. Joanne eventually went to New York, where she joined The Actors' Studio and Neighborhood Playhouse. She studied with Sanford Meisner, one of greatest American acting coach's of the 20th century. Meisner was adamant that Joanne must lose her Southern drawl. As it turned out, however, she portrayed Southern women in many of her major roles. Joanne made her first television appearance in a 1952 episode of Robert Montgomery Presents called "Penny." In the early to mid-1950s, she had roles in TV anthologies such as Good Year Playhouse, The Philco-Goodyear Television Playhouse, The Ford Television Theatre and Lux Video Theatre and Ponds Theater. In 1953, Joanne was introduced to fellow actor Paul Newman by Maynard Morris, the agent who represented them both. The two were later cast in the New York production of The Picnic, a play by William Inge. Woodward was an understudy and Newman had a minor role in the production as a renegade who wreaks havoc among the woman of a small Kansas town. The pair got to know each other during rehearsals. Paul and Joanne gradually fell in love. 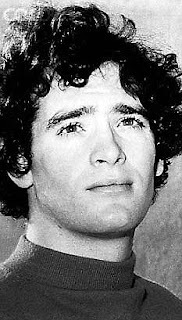 In his 2009 biography, Paul Newman: A Life, film critic Shawn Levy quotes Woodward as saying, "Paul and I were good friends before we were lovers. We really liked each other. We could talk to each other, we could tell each other anything without fear of ridicule or rejection. There was trust." They seemed perfect for each other. Unfortunately, however, there was one huge fly in the ointment. Paul was married to Jacqueline "Jackie" Witte, a stage actress, whom he wed on December 27, 1949. Paul and Jackie had three children, a son named Scott Newman (born September 23, 1950) and two daughters, Susan Kendall Newman (born February 21, 1953) and Stephanie Newman (born 1954). Jackie gave up acting when she had the children. In his biography of Paul Newman, author Shawn Levy writes about "a friend" who commented that that Paul and Joanne's romance was "more of an ordeal than a courtship. Paul was torn between his loyalty to his children and honesty with his feelings for Joanne. And Joanne, who was friendly with Jackie, suffered torments at finding herself in the role of a home-wrecker." According to Levy, Paul said he would carry the guilt with him forever. In the mid-1950s, Joanne moved back and forth between New York and California. 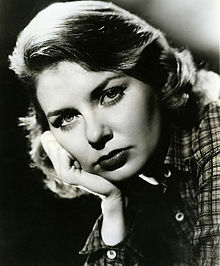 In 1955, she was cast in her first major Hollywood film role, a post-Civil War Western entitled Count Three and Pray. By 1957, Joanne had starred in two huge hits for 20th Century Fox, The Three Faces of Eve and No Down Payment. At the age of 27, she was Hollywood's newest star. Meanwhile, Paul's career was also on the rise and his work increasingly brought him to Tinseltown, where Joanne was filming The Three Face of Eve, in which she portrayed a woman with three different personalities - a Southern housewife, a vixen and an ordinary young woman. The Three Faces of Eve made Joanne a mega star. By the time she and Paul were cast in a film called The Long Hot Summer, both their acting careers and their love affair had bloomed. They spent a couple of months together on location in Louisiana. The film made them Hollywood's hottest couple and Jackie, who had been reluctant to divorce Paul, finally agreed to let him go. 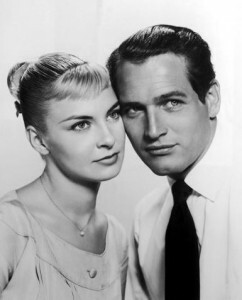 On January 29, 1958, soon after his divorce was finalized, Joanne Woodward married Paul Newman in Las Vegas, Nevada. Their wedding reception was held at El Rancho hotel-casino. They then flew to London, England for their honeymoon. On April 8, 1959. Joanne gave birth to the couple's first child, Elinor Teresa "Nell" Newman, who was named after Joanne and Paul's mothers. Two more daughters followed: Melissa Steward "Lissy" Newman, (born September 17, 1961) and Claire Olivia "Clea" Newman (born April 21, 1965). On March 26, 1958, Joanne Woodward received an Academy Award for Best Actress in a Leading Role for her outstanding performance in The Three Faces of Eve. She wore a handmade emerald green satin gown and John Wayne presented her with her Oscar. In 1969, Joanne was again nominated for an Academy Award for Best Actress in a Leading Role for her performance in the 1968 film Rachel, Rachel. The film, directed by Paul Newman, was based on a by a Margaret Laurence novel called A Jest of God.and Joanne won high praise for her portrayal of Rachel Cameron, a conflicted 30-something school teacher who lived with her mother. Joanne also starred as Beatrice, an eccentric, widowed mother of two daughters in 1972's The Effect of Gamma Rays on Man-in-the-Moon Marigolds. The film, based on the Pullizer Prize-winning play by Paul Zindel, was directed by Paul Newman. On November 20, 1978, tragedy struck the Newman family when Paul's only son, Scott Newman, died of an accidental drug overdose at the age of 28. Scott, an actor, was best known for his performances in The Towering Inferno (1974) and Breakheart Pass (1975). He died in Los Angeles of a barbiturate overdose. In the early 1980s, Joanne continued to perform in various television films such as The Shadow Box (1980), Crisis at Central High, (1981) and Passions (1984). In the late 1980s, Joanne returned to college to complete her degree. In 1990, along with daughter Claire, she graduated from Sarah Lawrence College in Bronxville, New York Paul Newman delivered the commencement address. In 1991, Joanne received her fourth Academy Award nomination Best Actress in Leading Role for her performance in Mr. & Mrs. Bridge. 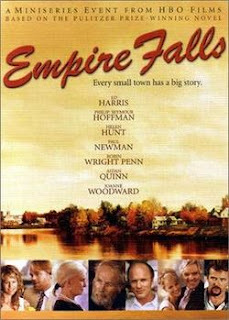 Woodward and Newman starred in the 1990 Merchant Ivory film with Joanne playing India Bridge, alongside Paul, who played her husband, Walter Bridge, the conservative patriarch of an upper-class World War II family. In the year 2000, Joanne persuaded Paul to join in her for a one-week run in A.R. Gurney's play Ancestral Voices. From 2001 to 2005, Woodward served as artistic director of the Westpoint County Playhouse. Paul Newman and Joanne Woodward made their home in Westport, Connecticut, not in the Los Angeles area. Back in 1957, Joanne told Hollywood columnist Sheilah Graham that she didn't dislike Hollywood but she'd "never become adjusted to it." She said, "Hollywood as a small town, like the one where I was born. I spent all my life trying to get away from it. Everything in Hollywood is small town. Everyone knows everyone's business." In 2005, Joanne and Paul starred in Empire Falls, HBO's adaptation of Richard Russo's best-selling novel. This highly acclaimed mini-series won a number of awards, including Prime Time Emmy Awards and Golden Globe Awards. It was Paul Newman's final onscreen role and the last time he acted with Joanne. He died of lung cancer in 2008 at the age of 83. * Joanne Woodward's brother, Wade, worked for the Bell Bomber and later became an architect. * In February of 1960, Joanne Woodward received a star on the Hollywood Walk of Fame. Although she is often cited as the first to receive a star on the famed walk, there really was no "first" recipient. The individual stars were installed as an ongoing project and there were no individual ceremonies. Joanne, however, was the first to pose with her star for photographers.